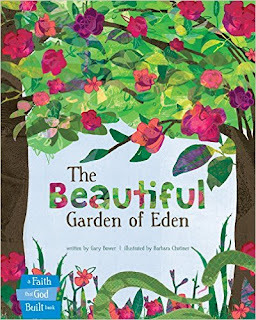 The Beautiful Garden of Eden by Gary Bower is a beautiful book for kids! My kids and I love the bright and beautiful illustrations throughout the book as well as the story of Adam and Eve. The story is told in rhyme scheme which my little ones tend to enjoy. My kid have been asking to read this story every night before bed since getting the book so they still enjoy it. My 4 year old love to sit and look at the pictures during the day and will often ask me to read it to her. I love that it teaches little ones about Adam and Eve and why sin ruined what was perfect and beautiful. Overall my family really enjoyed The Beautiful Garden of Eden by Gary Bower and I would definitely recommend this book! You can find The Beautiful Garden of Eden on Amazon, Barnes and Noble and other bookstores.